Bad idea, let's spend that money on things like clean water. Bad idea, books are cheaper and don't break. Bad idea... it will make them lazy gamers... like me. Bad idea... those laptops only run Linux. Terrible idea, every child needs more than one laptop, SHEESH! sydneygirl would like you Save her from crazy old cat ladydom, ... supergoo seeks Certified for Windows Vista stickers, ... ScholasticSpastic's been Feeling the Chemistry, ... and Callipygous presents The Politics of Fear. 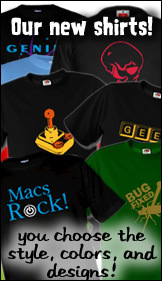 And in SuperFan Clubhouse Tidbits: pixel_pusher01is into Mac Collections 101.